IEEE-WIE NED student branch arranged a mentoring session “WIE GUIDE” for the newly elected WIE Executive Committee on March 10, 2010. 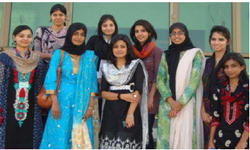 The speakers were Ms. Rabia Khalid, Chairperson IEEE PNEC Student Branch & Ms. Nimra Kazmi, Karachi Section Representative, GINI IR.They jointly presented their ideas for the smooth running of WIE Affnity Group, They discussed the possible hurdles any organizing committees might come across during the planning, management and execution phases of any event. Ms.Wardah Noor, former Secretary IEEE PNEC also shared with the WIE NED Ex-Com the reporting procedures within the Section & Region. All in all, the speakers made their point that effective management and efficient execution is the key to a successful event. WIE PNEC BEATS THE HEAT AT BEACH !! In a nut shell, the full day long party was a remarkable effort by WIE AG PNEC so that our hardworking individuals can get a well deserved break from hectic life of the university. ASP-TECH and SQL Learning was a 2-day technical workshop organized by IEEE-WIE NED student branch on 16th and 17th March 2011. The Speaker for the event was Mr. Fareed Nizami, the academic co-ordinator of curriculum and trainings at APTECH CENTER Karachi. On day1 he discussed the SQL Server 2005 and explained its features with a sample scenario. On day2 he gave a brief introduction to .NET Framework 2.0, 3.5 and 4.0 and a thorough introduction to ASP.NET. He also showed students how to create a simple ASP.NET website with proper linking with the Database created on day-1. A great technical workshop organized by WIE-NED which was up to the need of majority students of computer system from NED. 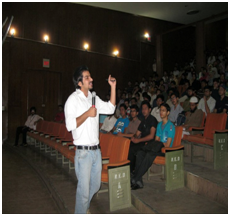 IEEE-WIE NED organized “KEYS-Knowledge and expertise for your success” on 23rd July 2011 in the NED Auditorium. The reputed & popular speakers i.e Mr. Umair Jaliawala, Mr. Sumair Abro and Mr. Ghazanfar Nizami were invited . The Event was aimed to facilitate engineering students with useful knowledge for a bright and successful engineering career. The first session was conducted by Mr. Umair Jaliawala in which he mentioned that not only physical outlook but the content should also be considered while giving an effective presentation. The second consecutive session was conducted by Mr. Sumair Abro who guided the engineers on 'how to market themselves' but gave them useful tips for achieving success in any professional environment. The third session was conducted by Mr. Ghazanfar Nizami, he guided students regarding job interviews and how can students easily clear it without any fear. He advised that the candidate should remain genuine and truthful. Mr. Ghazanfar’s session was very informative for the students and it clearly answered every question regarding any job interview.